Nursing Home Arbitration Agreements | Hupy and Abraham, S.C. When an individual seeks to become a resident of a nursing home or long-term care facility, there is often an overwhelming amount of admission paperwork to sign. For many years, it was standard practice to find an arbitration agreement hidden among the many admission documents. This committed a nursing home resident to arbitration even before a dispute developed about something as serious as nursing home abuse or neglect. Arbitration is a form of alternate dispute resolution in which a legal issue is settled outside of court. One or more arbitrators decide the outcome of the case, rather than a judge or jury. Typically, the decision of the arbitrator is binding and cannot be appealed in court. Takes advantage of residents during the admissions process. Nursing home admissions can be unplanned or often happen when there is a rush to enter a facility right away. Individuals are often pressured into signing arbitration agreements, without necessarily knowing what disputes will ever occur or what arbitration even entails. Under such circumstances, an informed decision is not likely. Denies residents the benefits and advantages of a court of law and trial by jury. Arbitration can be very costly. Residents and families usually require a lawyer, and they may have to pay an arbitrator’s fee as well. What’s worse is that arbitrators are private individuals, rather than publicly elected or appointed officials like judges, who have your best interest in mind. Once a decision is made in arbitration, it typically cannot be appealed in the court system. Puts residents at risk. Arbitration agreements take away the ability of injured residents and their families to hold the facility accountable in a court of law. With little or no oversight, facilities then have no incentive to prevent incidents of abuse and neglect from being repeated. When residents cannot hold facilities accountable for poor treatment, neglect and abuse through a public and unbiased legal process, the well-being of all residents may suffer. 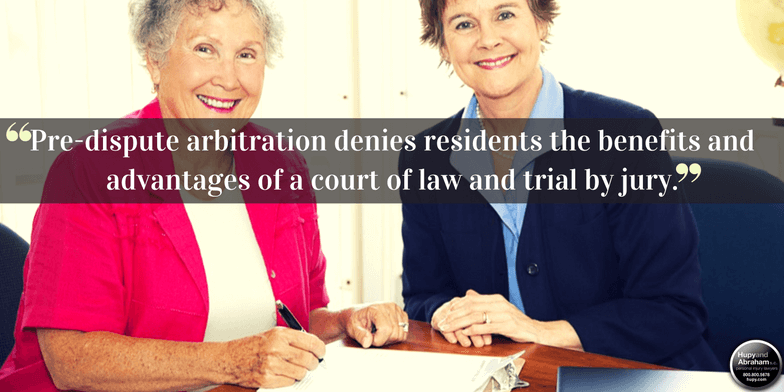 However, since this practice of required arbitration agreements became standard in most nursing homes, many nursing home residents were left with no choice but to agree to arbitration or to forego the nursing home care they need. In September 2016, the Centers for Medicare and Medicaid (CMS) issued a new rule about forced arbitration to all nursing home facilities that accept federal Medicare or Medicaid funding. As of November 28, 2016, nursing homes that accept Medicare and Medicaid funding can no longer make signing an arbitration agreement a requirement for admission to the nursing home facility. Voluntary agreements are still permissible. What Does All of This Mean If Your Loved One Has Been Hurt? Regardless of whether or not your loved one signed an arbitration agreement, it is important to talk to an experienced lawyer about any allegations of nursing home abuse or neglect. Your loved one has suffered real damages because of an action (or inaction) that never should have happened. We want to help you protect her rights. Please call us anytime—24/7/365—at 1-800-800-5678 or via this website to learn more about how nursing home abuse and neglect cases work and about your loved one’s possible recovery.